For a mid-summer wine dinner Linda prepared grilled sockeye salmon, strip steaks, asparagus spears, twice baked potatoes, mix green salad and some surprise deserts and palette teasers. Beth brought a squash casserole accompaniment. Prior to dinner we feasted on a medley of artisan cheeses brought by Dan, and shrimp cocktail. Often when we're gathering we determine a wine theme for the evening and folks bring something accordingly. Tonight we were void of a theme other than folks knew the general menu offering. I find it remarkable how our wine pairing flights came together to create a wine experience and to complement the food. Of course Bill brought a vertical duo pairing, and we created a pairing with me matching Dan's Cab and Champagne selections. 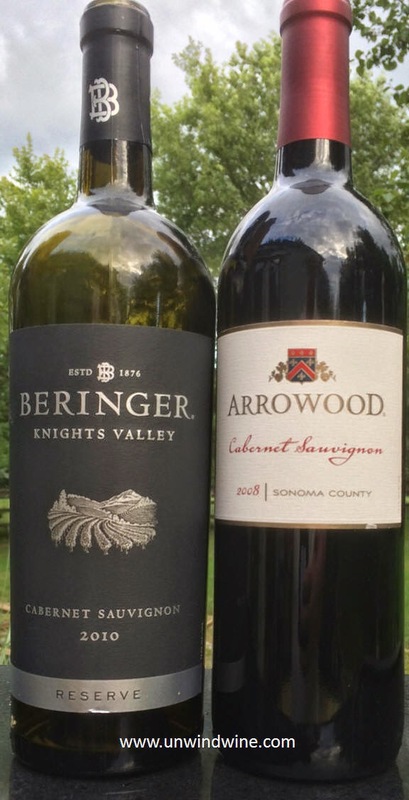 But ironically, Lyle and Bob each brought similar regional Sonoma Cabernets to compare. And of course I crafted the white flights to the meal selections. The result was a fun, interesting and intriguing wine experience. 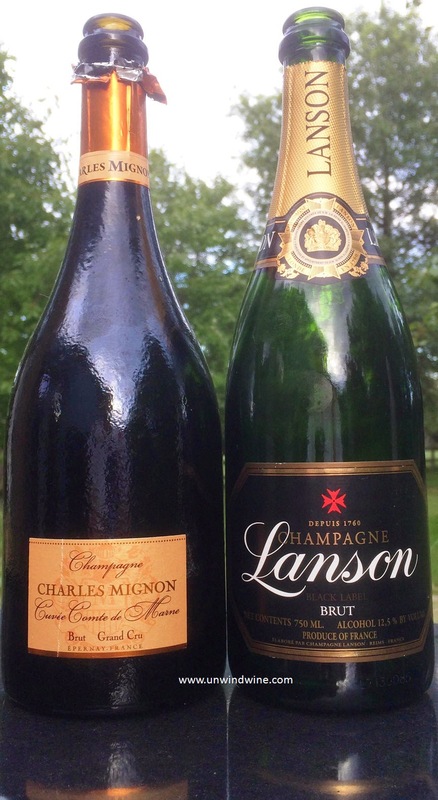 The first wine flight was a pair of French Champagnes - Dan brought this Charles Mignon Cuvee Comte De Marne Brut Grand Cru and I pulled a Lanson Black Label Brut NV from our cellar. 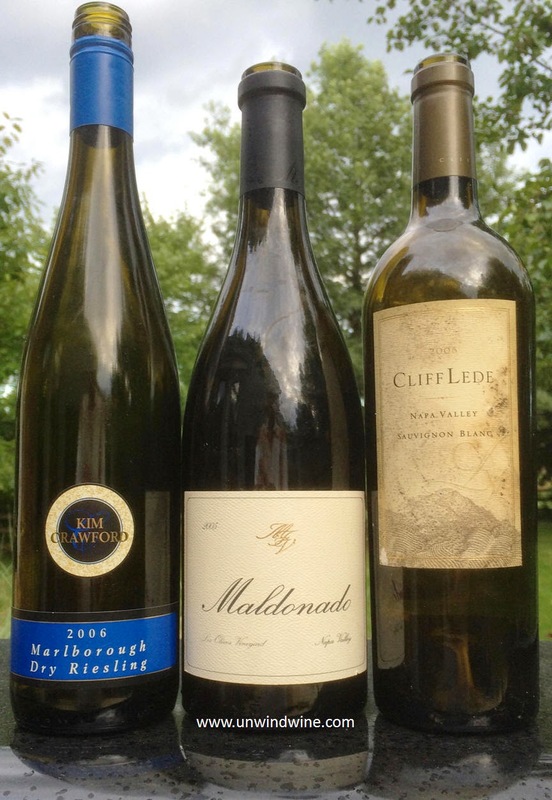 With dinner salad and the salmon we served Kim Crawford Marlborough Dry Riesling 2006, and then Maldonado Los Olivos Vineyard Napa Valley Chardonnay 2005, respectively. Then came a surprise. Linda prepared a mango lime ice garnished with mint leaves as a palette cleanser (left) before moving to the beef steak course. 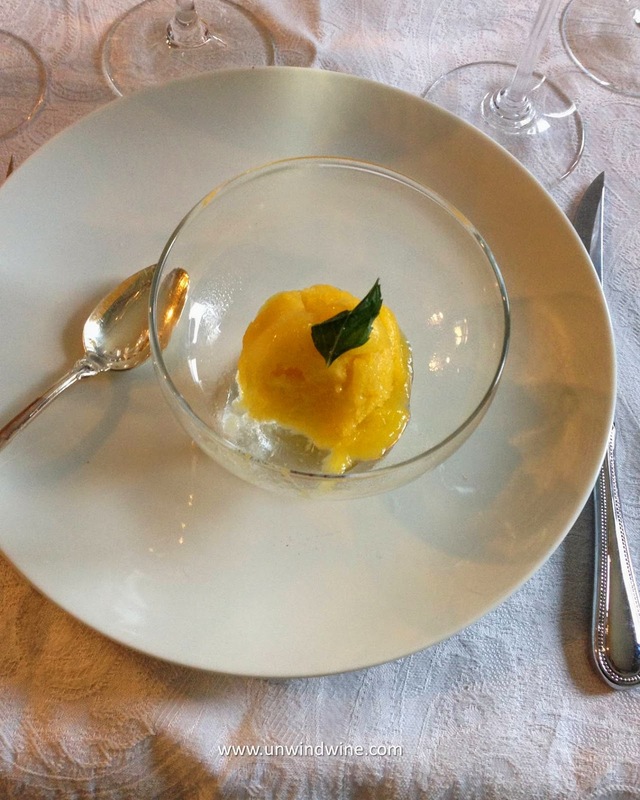 We paired the mango ice with Cliff Lede Napa Valley Sauvignon Blanc 2005. With the steak course we had a series of Cabernet pairings. We served them according to convention - older first to detect the nuances of maturity, complex, refined and polished wines next, followed by younger wines that will be more adolescent and exuberant in character. Of course the lighter whites wines went first - from lighter champagne, then dry, progressing to fuller and sweeter, to accompany the shrimp, cheeses, salad course and salmon. And the finale was the dessert wine and or vintage port which went with hearty chocolate and pie. Bill brought from his cellar a Freemark Abbey mini horizontal duo of Bosche Vineyard and Sycamore Vineyard Cabernet Sauvignons from 1995. We then moved to a pair of Stags Leap District Napa Cabernets 2006; Dan brought the Lindstrom and we matched it against Cliff Lede. Lyle and Bob each brought Sonoma Cabernet Sauvignons - Lyle, a Beringer Sonoma County Knight's Valley Cabernet Reserve 2010 which we paired against Bob's Arrowood Sonoma Valley Cab 2008. For dessert, Linda prepared a chocolate silk cream pie and a fresh key lime pie served with fresh whipped cream and a selection of chocolates including decadent dark chocolate caramels with sea salt. I had set aside a Monbazillac 1999 which I had placed in the freezer and left it too long as it started to freeze. 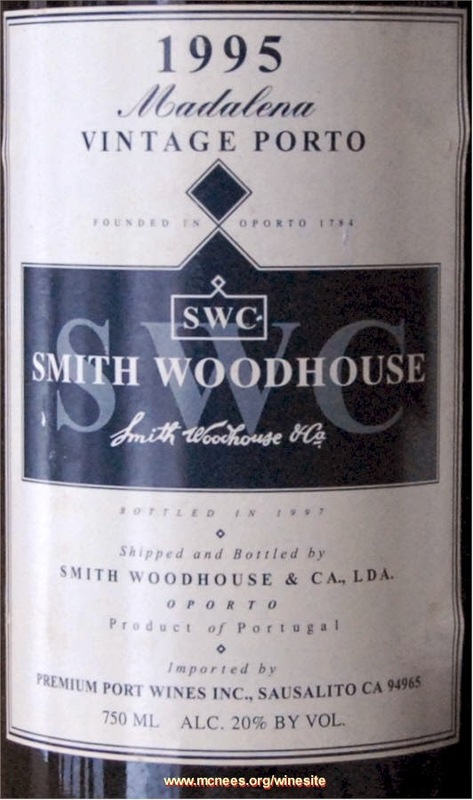 We did an impromptu cellar dive and pulled from a selection of vintage ports a Smith Woodhouse Madalena Vintage Port 1995. Kim Crawford Marlborough (New Zealand) Dry Riesling 2006 - with the salad course. 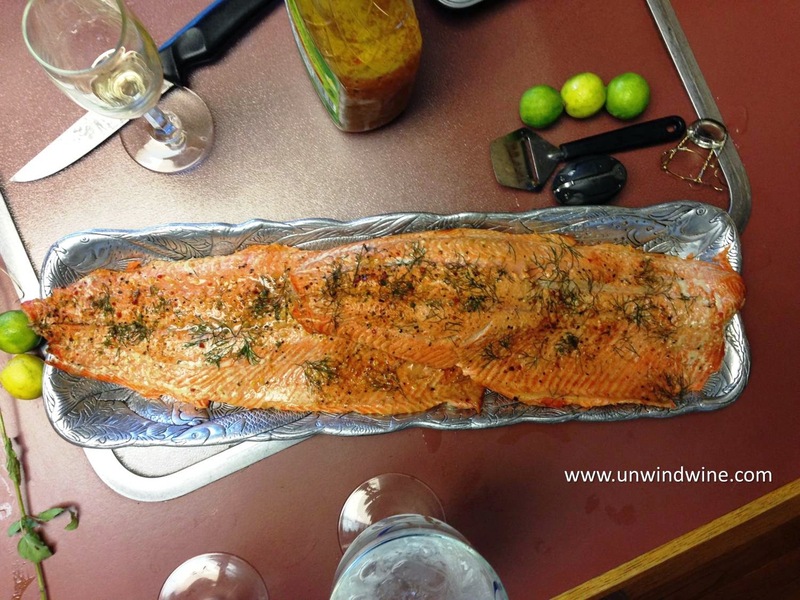 Maldonado Los Olivos Vineyard Napa Valley Chardonnay 2005 - with the salmon. Cliff Lede Napa Valley Sauvignon Blanc 2005 - with the Mango Lime ice. Bill's brought from his cellar with its extensive vertical of Freemark Abbey Cabernets these single vineyard designated selections from Bosche and Sycamore. Our visit to the winery was highlighted by our tour and trolling through the cellar library during our 2009 Napa Wine Experience trip. We have numerous stories about Freemark Abbey tasting experiences that accentuated the wine presentation and animated the dinner conversation, some of which are featured elsewhere in this blog. Freemark Abbey Bosche Vineyard Napa Valley Cabernet Sauvignon 1995 - Perhaps not surprising, this label proved to be one of, if not the tasting highlight (s) of the evening. My own Cellartracker notes and rating from 9/2/2013, about eleven months ago accurately apply to tonight's tasting - I wrote: "An eye-opening standout of th(at)e evening featuring a horizontal tasting of five 95 vintage Napa Cabs, this was medium to full bodied with bright vibrant forward ripe plum and black raspberry fruits accented by tones of currant, clove, hints of vanilla and sweet oak with smooth polished silky tannins on the finish. Lots of life left in this eighteen year old." Then and now - RM 91 points. 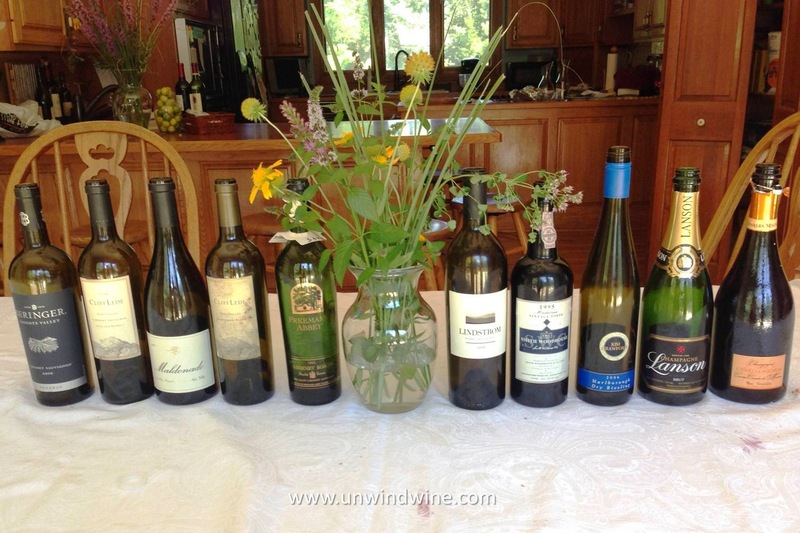 Bill's Cellartracker notes from the evening: "The hit of our wine dinner with friends. Inky, purple color STILL. No signs of aging. Nose a bit musty on opening but blew off after an hour to reveal expected aroma of eucalyptus and a hint of spice. Chocolate, clove, mint, cassis and blackberry on the palate. Fully integrated tannins but still has some backbone and a long finish. Tasted side by side with a '95 Sycamore." Freemark Abbey Sycamore Vineyard Napa Valley Cabernet Sauvignon 1995 - There was a remnant left in the bottom of this bottle Monday evening, and remarkably, 48 hours after opening, it was actually improved over Saturday. Dark garnet colored, medium bodied, upon opening, it presented forward black cherry fruits with a slight tart edge, before turning to a layer of black berry and earthy leather. Two days later, it took on a mouthful of smoke that quickly turned to complex layer of anise turning to cognac like alcohol that lingers on and on with tones of spice and leather on the smooth firm tannin finish. Dan brought this Lindstrom Stags Leap District Napa Valley Cabernet Sauvignon 2006 which promised to be the showcase wine of the evening, a special offering since this wine comes from a property of an associate of his brother. This premium label is 100% Estate Cabernet Sauvignon sourced from carefully selected fruit from eleven blocks at their four acre hilltop Nicali Vineyard in Stags Leap District, Napa Valley, named for Greg and Carol Lindstrom's two daughters—Nicole and Ali. The vineyard is adjacent to vineyards of well known producers Stag's Leap Wine Cellars, Shafer Vineyards, and Joseph Phelps Vineyards. It was undeveloped until recently due to its steep hillsides and complex topography. The subtly and finesse of the Lindstrom was at risk of being overshadowed by the bigger more obtuse forward fruits of the Lede and Bosche. Dark inky purple and full bodied, the care in viticulture and selection was apparent in the understated style of full bodied complexity with finesse and polish. Tight and a bit closed yet, this will no doubt age gracefully for several years. It will be fun to see how it reveals itself in ten years. Elegant tones of subdued black berry and black raspberry fruits are accented by a layer of tea with hints of currant, cedar, black olive herb and sage on a smooth moderate tannin lingering finish. To compare aside the Lindstrom, I pulled this Cliff Lede Stags Leap District Napa Valley Cabernet Sauvignon 2006. We discovered Cliff Lede wines and his blockbuster Poetry at the Wine Spectator Grand Tour in Chicago in 2009. Established in 2002, Cliff Lede Vineyards encompasses sixty acres in the Stags Leap District at the foot of and across the Silverado Trail from Stags Leap on the eastern floor of Napa Valley. The flagship, Poetry Cabernet Sauvignon is sourced from the steep hillside portion of the estate that sits above the valley adjacent to the tony Poetry Inn boutique inn. Our visit to Cliff Lede Estate was a highlight of our Napa Wine Experience Tour in 2009. Six years after release, the 2006 Lede Estate Cabernet seems to be reaching its stride at the apex of its tasting curve. Medium full bodied, deep ruby color with full forward blackberry and black and red currant fruits with tones of mocha, clove spice and hints of tar and sweet oak on a smooth polished flavorful lingering finish. Bills notes from our tasting last year: "Deep, opaque,purple color. Long legs. A bit of perfume, tobacco and spice on the nose. Big and fruit forward, this is a complex wine with layers of black raspberry, plum and blueberry, evolving to chocolate, clove and a hint of tobacco. Drinking very well now but certainly has 5 to 8 years left."